South Adelaide travel to Unley to face Sturt in their Round 5 SANFL Statewide Super League Anzac Round clash this Sunday. The Panthers will make at least two changes to the side that played out a dramatic draw against Adelaide last weekend. Young small forward Darnell Tucker is unavailable due to State U18 commitments, while Noarlunga recruit Kyle Emery has been sent back to the Reserves after two League games. This opens the door for two debutants against the Double Blues. Brett Kennedy, 20 years old from Pooraka Football Club, is set to play his first SANFL match after being named in a forward pocket. Meanwhile, at the other end of the ground, 25-year-old Lee Hoey, recruited from Morphett Vale and son of past player Greig Hoey is also a confirmed inclusion after a strong start to the season in the twos. Big-bodied midfielder Ben Heaslip and rebounding defender Jaidan Kappler could also be in line for a recall after standout performances in the Reserves last Thursday, but must survive the cut of an extended interchange. Following the League match, the Panthers will be awarding the inaugural Frank Barry Medal in a new Anzac Round tradition for the club. Meanwhile, in the Reserves several changes have been made due to State U18 and League commitments. Full squads below. This Sunday, South Adelaide's Under-18s open a triple header with the Double Blues, while our Under-16s battle Glenelg for a place in the 2019 Grand Final! South Adelaide will celebrate Anzac Round this season with the inaugural presentation of the Frank Barry Medal following the Panthers Anzac Round clash with Sturt on Sunday afternoon. In a new Anzac Round tradition, a Medal will be presented to the South Adelaide player whose conduct and play during the game best demonstrates the qualities of skill, courage in adversity, self-sacrifice, team work and fair play that befit the Anzac Spirit. The Medal has been named after South Adelaide's first Magarey Medallist, Frank "Dinky" Barry, who was awarded South Australian football's highest individual honour as the competition's 'fairest and most brilliant player' in 1915. A brilliant rover, he was known for his strong mark, cool and calm approach, precision with hand and foot, and his love to run and baulk. Barry went on to serve in World War I, embarking with the First AIF to serve in France. Upon leaving his is quoted as having said, "I hope to do as well at Gallipoli as on the football field, and if VCs are about, I will be a trier". He fought in the horrific conditions and carnage of the Western Front and achieved the rank of second lieutenant. During this time Barry contracted trench foot, requiring periods of time in hospital, and despite surviving the war would never return to playing football due to complications with his foot. Sadly, the whereabouts of Barry's Magarey Medal are unknown. The legend goes that Port Adelaide's Sampson 'Shine' Hosking, who lost the medal to Barry on an umpire's countback, challenged Frank on his medal win, after which Barry retorted, "you can have it!" and threw the medal at him. Due to the brevity of his career, Barry was not considered for the 'Greatest South Adelaide Team' and is not in the Panthers Hall of Fame. It is fitting his legacy at South Adelaide will now be honoured through this new medallion. Post-war Frank did briefly coach a Barossa Valley team, while he also managed a River Murray fruit block before settling in Wayville and working for the SA Produce Board. However, Frank's love for football remained and was indeed returning home from a SANFL game in 1963 that he sadly suffered a heart attack aged 70. The Barry name has long been linked with the South Adelaide Football Club. Great-nephew George served as a drinks steward for 21 years and is now a Life Member. George's son Brett played junior grade premierships and daughter Kelly worked for the club. Frank's great grandson, John Barry will present the Medal on behalf of the Barry family after the Panthers Anzac Round game. South Adelaide and Adelaide played out a thrilling draw at Flinders University Stadium on Easter Saturday. The match was the classic tale of two halves, as the Crows dominated the first two quarters before South stormed home and came agonisingly close to claiming an unlikely victory. After finding themselves down by as much as 49 points late in the second quarter, South clawed their way back in the third term and Tom Whittlesea's kick to win the game came just seconds after the final siren to leave the scores locked at 10.13 (73) to 11.7 (73). The result left South supporters with a bizarre but not entirely unfamiliar feeling, as many recalled memories of the 1997 season in which the Panthers played consecutive draws against West Adelaide and Glenelg. The Panthers will be left regretting a poor first quarter that gave Adelaide a six goal head start, but should be pleased with the fightback that came so close to claiming the points. Co-captain Matt Rose inspired his troops with a gutsy performance in defence, racking up 20 touches and seven tackles while setting up plenty of play out of the Panthers backlines and shutting down a rampant Myles Poholke in the second half. Fellow defender and former skipper also put in an impressive performance down back, limiting AFL-list man mountain Josh Jenkins to just 11 touches and two behinds. Up forward, Mark Noble did the majority of the damage for the hosts, booting three goals from his 15 touches, while Malcolm Karpany chipped in with a pair of his own. In the first half it was Adelaide doing all of the damage on the scoreboard. The Crows controlled the stoppages and outworked South on the spread in a scintillating first term, kicking 6.2 to just three behinds. More impressively, Adelaide's dominance came against a strong breeze. The only highlight in the quarter for South came in the form of a Liam Fitt hanger, as he clunked a spectacular mark, but again could not convert the set shot. The Panthers finally got on the scoreboard in the second term with Fitt dribbling one home. However, Adelaide continued to maintain control of the contest, with Poholke running hot with 22 touches and four goals in the first half. By the time James Matthews kicked his first the Crows lead was 49 and all hope looked lost for a Panthers comeback. However, Jarrad Wright's men emerged from the rooms a different side in the third term. The old firm of Nick Liddle (29 touches, nine tackles, six clearances and a goal) and Joel Cross (29 possessions, seven inside 50s and eight clearances) started to turn the tide at the coal face, while Ben Haren pushed up onto a wing a provided some much needed drive forward with his 22 touches. Early goals to Noble and Tom Whittlesea gave the home side some spark, but not many would have predicted the run to come. Karpany marked a high ball and converted a neat left-footed snap from the pocket, before Noble floated through his second and Liddle banged home a long-range set shot. All of a sudden, the margin was back to 10 and the Panthers were right back in the contest. Karpany slotted his second on the run soon after to set up a grandstand finish with only a solitary behind separating the sides. If not for some wayward kicking (6.6 for the term), South could have well and truly found themselves in the lead. The hosts did remarkably well to turn the tide and hold the rampantly scoring Crows scoreless in the third but turned for home kicking into the breeze themselves. The teams traded goals in the final frame, with the highlight coming from a brilliantly weighted Karpany handball to a running Emmanuel Irra to snap his first. Noble's was taken high as the game entered time on and his third levelled the scores. It set up a pulsating finish with the crowd erupted for several critical defensive marks from the Panthers. The comeback was poised to be completed as a defensive clearance landed in the hands of Whittlesea well within scoring range. However, the siren sounded as he gathered his steps and as his shot crossed the line for a behind the reality of a second draw in a row set in across the ground. Despite the remarkable result, South maintain their hold on second on the ladder, effectively trailing the undefeated Norwood by a single game. The Panthers are next in action from 2:10pm this Sunday, April 28 with their Anzac Round clash with Sturt at Peter Motley Oval. South Adelaide's senior women have secured their place in the 2019 Finals with a win over ladder leaders Norwood on Saturday afternoon. The Panthers continued their unbeaten run at Flinders University Stadium thanks to an impressive second half, eventually running out 5.6 (36) to 4.5 (29) victors. The hosts set up the well-earned win with a blistering third term that saw them kick 4.4 to no score and over come a halftime deficit. The win holds South in second position on the ladder, with a win over West Adelaide in a fortnights securing the double chance heading into the major round. In sunny, but blustery conditions the two sides played out a tense opening period. Inspirational skipper Lauren Buchanan opened the scoring within two minutes after taking a strong mark at the southern end. However, the Redlegs put a quick reply through the big sticks thanks to Adelaide Crows midfielder Sally Riley. The second term belonged to the visitors as South struggled to clear the ball out of their defensive 50 against a strong breeze. In a backline under some serious duress at times, Jaslynne Smith stood tall to marshal the troops, combining with Cheyenne Hammond to clear their defensive arc eight times. The Redlegs though held most of the play in their front half and former Opals basketballer Jo Hill snapped one from the goal mouth and Monique Hollick dribbled one home from long distance to give Norwood a two goal buffer at the major break. After halftime the Panthers began to work their way back on top with the wind at their backs. Czenya Cavouras (22 touches and eight tackles) was a key catalyst as she continued her strong season racking up possessions and applying physical pressure around the ground. Meanwhile, Nicole Campbell (13 possessions) and Elyse Haussen (20 disposals and four clearances) also ensured South's forward were getting their share of attacking entries. Young gun Teah Charlton also threatened to blow the game open, gathering 18 touches and laying 14 tackles, but was wayward in front of goals managing just five behinds. The Panthers steadily clawed their way back, as Tamara Page reacted the quickest in the goal square to snap home an opportunistic six-pointer. Haussen drew scores level after opening the angle on her set shot from the playground pocket, but the highlight of the term came from Hannah Munyard. With the wind at her back, Munyard unleashed a bomb from 40m to give South a nine-point lead as the teams turned for home. Madison Bennett pushed that margin to 16 with a soccered effort just after the restart, before Norwood through everything they had at regaining the lead. Playing with the wind, the Redlegs again controlled the majority of possession in their forward half, but some resolute defending from South managed to keep the visitors at bay. Hollick missed from direct in front, before snapping her second with the outside of her boot to cut the lead to nine and keep the Panthers on their toes. Norwood had numerous further chances to attack, but some excellent defensive marks from Hammond and Montana McKinnon proved critical. South held firm until the final siren to secure their place in the major rounds and inflict Norwood's first defeat of the season. The SANFL Statewide Super Women's League has a competition wide bye this weekend. 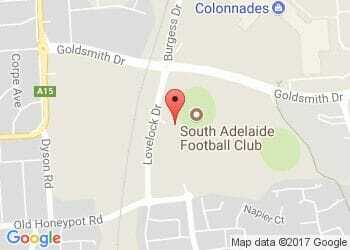 South's next game comes against West Adelaide on Saturday, May 4 from 3:45pm. Help support Women's Football with a tax deductible donation! South Adelaide's Reserves fought hard but were ultimately overcome by Norwood at the Parade on Thursday evening. The young Panthers fought back from a slow start to lead at halftime, but could not hold off a fast finishing Redlegs outfit and fell to a 9.6 (60) to 11.9 (75) defeat. South found themselves 21-points down at the first change, with Nathan Beenham's goal the only major score for the Panthers for the term. However, a blistering five-goal-to-one second quarter all of sudden had the visitors taking a four-point lead to the rooms. Unfortunately, Norwood steadied and control the final two quarters, outscoring the Panthers 6.4 to 3.3 to claim a 15-point lead. Ben Heaslip responded well to being sent back to the Reserves, racking up 27 touches, five tackles and five clearances. Meanwhile, Jaidan Kappler (22 possessions, six tackles and six clearances) also put his hand up for a recall with another strong performance. Amongst the other handy contributors were Tate Lovering (18 disposals), Brett Kennedy (16 touches, 11 tackles and a goal), Reece Milsom (15 touches and two goals) and Connor Fairlie (18 possessions and a goal). The Reserves now prepare for Sturt at Unley next Sunday, April 28. South Adelaide's Under-16s booked their spot in the Finals with a hard-fought win over Norwood at the Parade on Wednesday evening. We travelled to Norwood on a Wednesday night to face the Redlegs. A time slot not many of our players would played at before! Playing the last game of the minor rounds, it was one we had to win to secure our place in the Finals. The game was very well posed throughout the first quarter, with both sides having plenty of opportunities to score. We gained control in the back half of the term and managed to capitalise on the scoreboard and in at the first break with a handy lead kicking slight breeze. In the second, Norwood had total control and some very undisciplined defending in our back half enabled them multiple opportunities on goal. Fortunately for us they did not hurt us on the scoreboard. We needed a response after halftime to keep our season alive. To the players credit they did just that and managed to come into three quarter time a goal to the good. With seasons on the line for both club, and us playing a man down after Zaine Norman-Brown hurt his wrist, our young Panthers showed enormous courage to win the game and secure a Finals berth in 10 days time. South Adelaide's Under-18s have claimed a 20-point victory over Norwood at the Parade on Wednesday night. In Round 4 we played our fourth game in a row at an away venue. This time against Norwood at the Parade, grinding out a 20-point win! This week we made two changes to the team that lost to North by less than a kick last weekend. Matthew Coulthard came out due to injury, which opened the door for Wade Sweetman from Encounter Bay to play his first game, while Sam Hindes made way for our captain Aaron Douglass to come back in after a week out with illness. With a short turn around in between games, and this week Playing Norwood at Norwood which is always hard, we needed to prepare well and make sure we had a good start. The Redlegs came out firing and kicked the first goal a minute into the game and signs were not good. To the credit of our players, we steadied quickly and kicked the next four goals, with James Grimley and Mitch Riddle kicking one each and Liam Hamilton kicking two. We went into the first break with an 18-point lead. In the second quarter, Norwood controlled the football more and had 20 more disposals and 10 more uncontested marks. Both teams had the same amount of scoring shots, but we made more of our opportunities in front of goal and extended or lead to 23 points at halftime. The third quarter was a real arm wrestle and neither team could break free. It took Norwood until halfway through the quarter to kick their first and it took until Grimley kicked his second at the 23-minute mark before we could get one of our own. Tyler Oliver and Lachlan Williams started to show some form through the midfield. The last quarter was a worry. In other games we have let teams kick multiple goals in short periods. The challenge for us was could we control the tempo of the game when Norwood wanted to play quick. Norwood again kicked the first and looked to have momentum, but we countered with Beau McCreery kicking his first of the night. The Redlegs kicked their second for the quarter and then missed some other opportunities before Riddle kicked his third for the night 12 minutes in to push our buffer to 21 points. With eight minutes to go Norwood kicked their third for the quarter, which cut our lead to 13 points and the game was well and truly still alive. Douglass, Oliver and Hamilton showed some great composure with the ball to soak up time off the clock. When Hamilton kicked his third the game was out of reach for Norwood. I was very proud of the players and the way the grinded out a win. They have learned from the past couple of games and got the job done. Now we have a few days off for Easter, before getting ready to play away game number five against Sturt at Unley in a triple header prior the Reserves and League game.